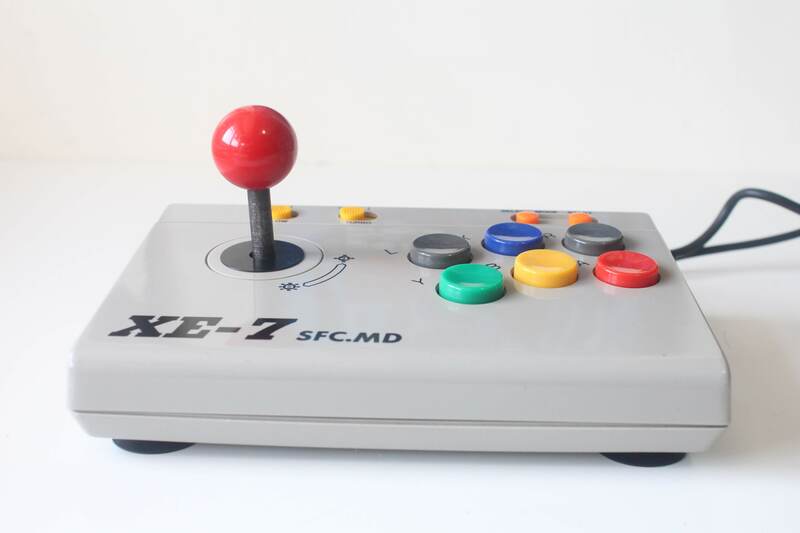 The XE-7 SFC.MD is a joystick manufactured by Honest, a Taiwanese company known for their various gaming accessories. 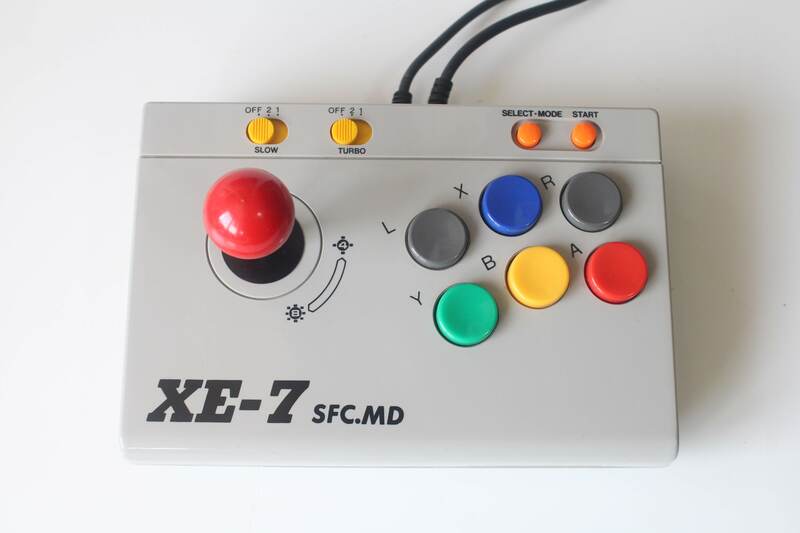 The joystick if for use with both the Super Famicom (SFC/SNES) and the Mega Drive (MD/Genesis), and the color scheme follows closely with the Super Famicom colors. 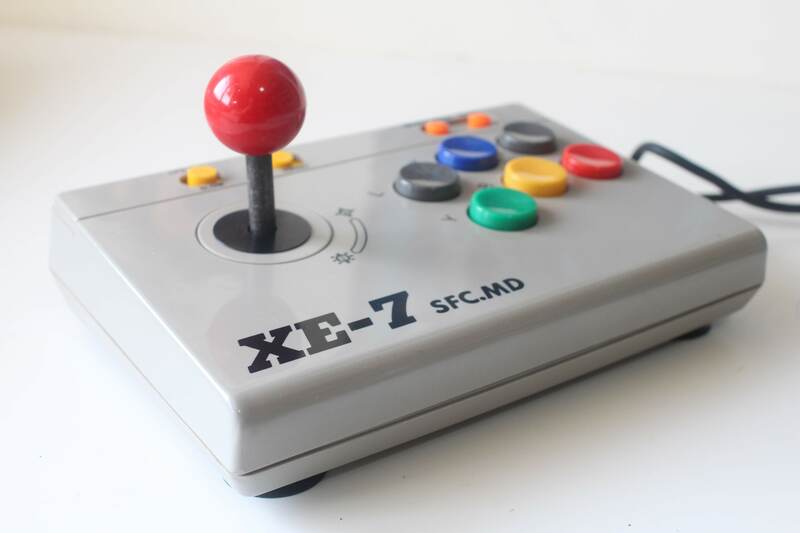 The joystick is seemingly modeled after Dempa’s XE-1 ST joystick. The most notable similarities are the font and positioning of the name, and the yellow switches. 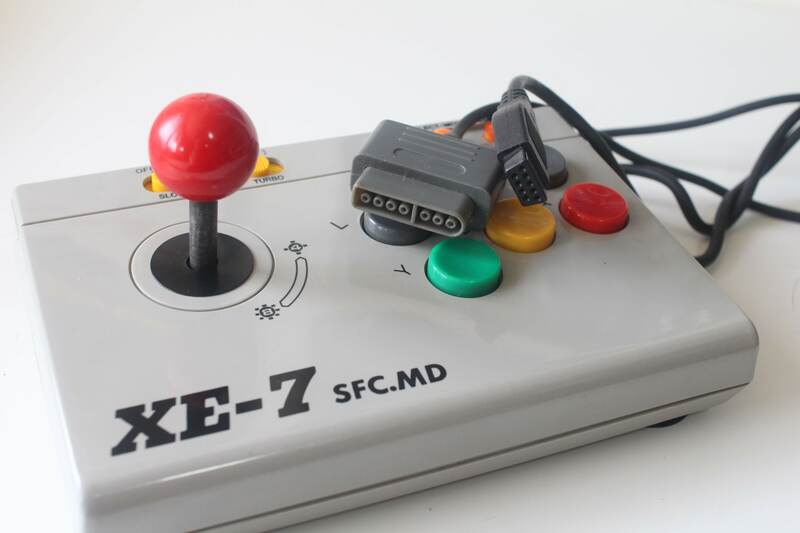 Like the XE-1, the XE-7 also has markings that indicate the joystick can be changed between 4 to 8-way movement. However, as you’ll see in the tear-down below, the XE-7 has no such functionality. 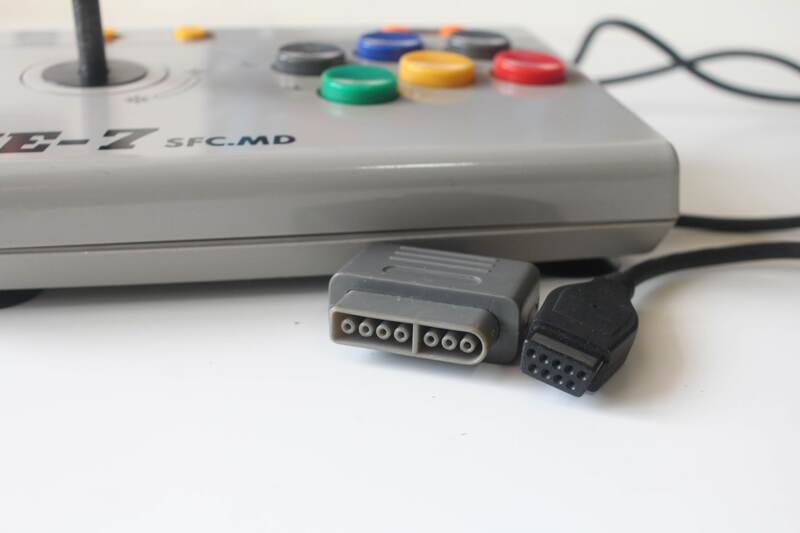 As the name suggests, the XE-7 SFC.MD is compatible with the SFC/SNES and MD/Genesis via two separate connectors. This means you can connect to both consoles at the same time without needing to swap cables back and forth. 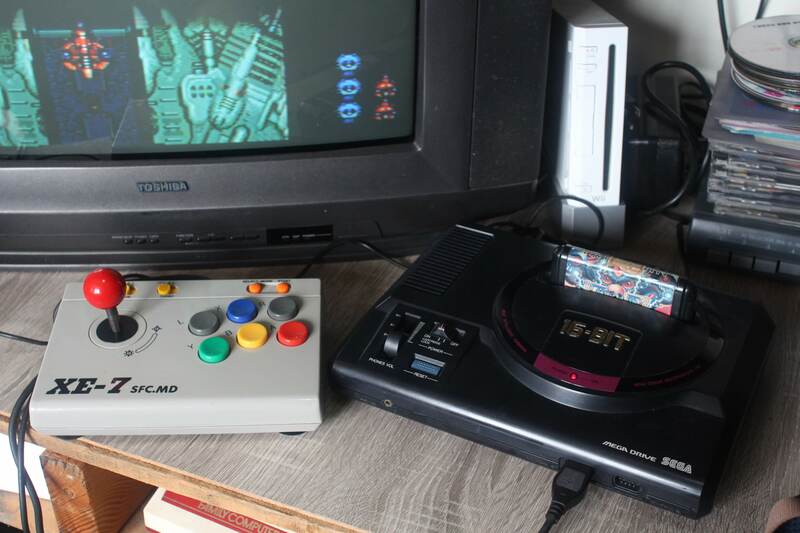 Useful if you have your SFC and MD ready to play next to the TV. 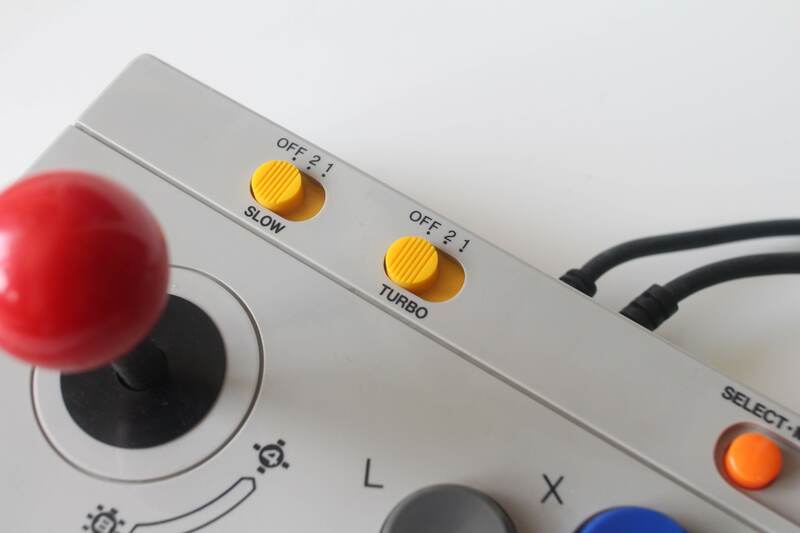 The two yellow switches at the top of the joystick are for slow motion and turbo. 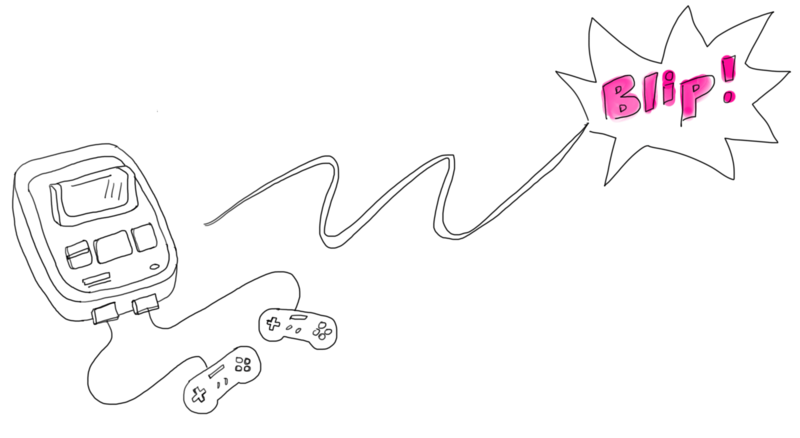 The slow motion functions by repeatedly pausing the game, and when activated the turbo applies to all action buttons. The switches have three settings. Off, 2, and 1. 2 being the slower, and 1 being the faster of the settings. 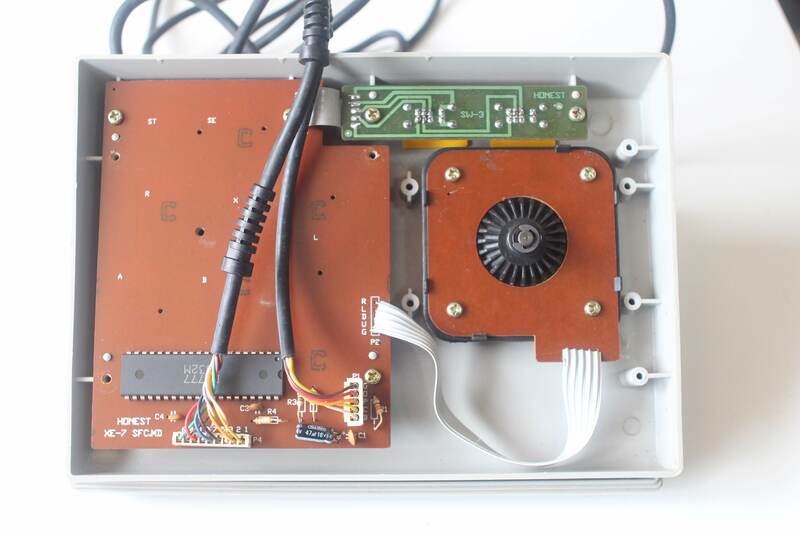 Inside the case are 3 boards, one for the main buttons and chips, and the other two for slow/turbo buttons and the joystick itself. 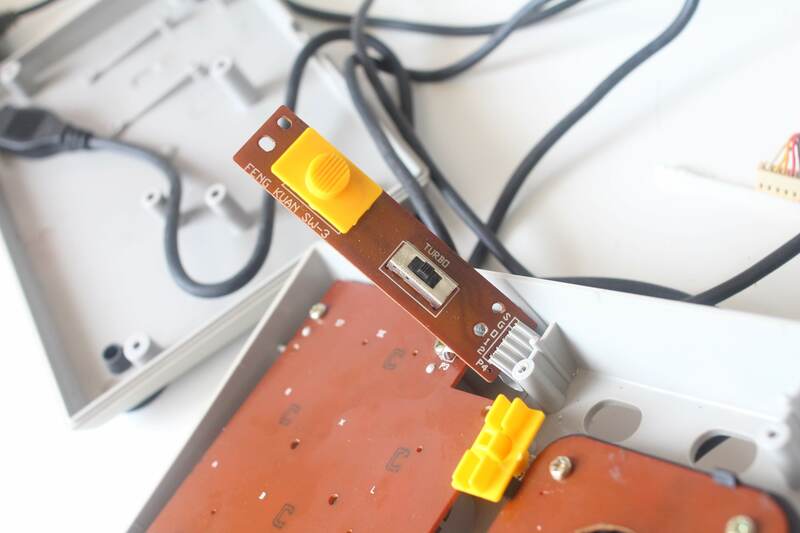 The joystick does not use micro switches, and instead uses conductive pads, just like the action buttons. 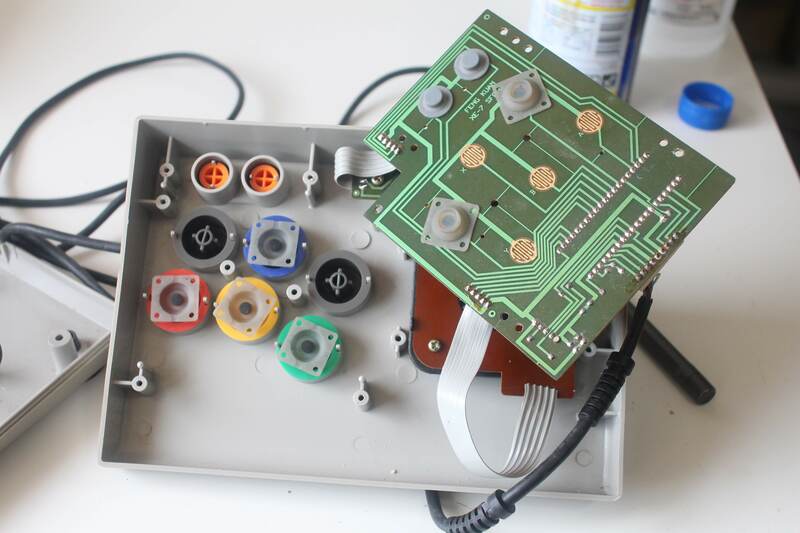 The joystick is held in place by a spring and circlip and works by pushing/squeezing the conductive pads up against the large plastic ring and inside-top of the case. Also note that there are only four pads, so this joystick cannot be set to 8-way movement as the printings on the top of the case suggests. One of my main reasons for opening it up was to clean the joystick which was squeaking. 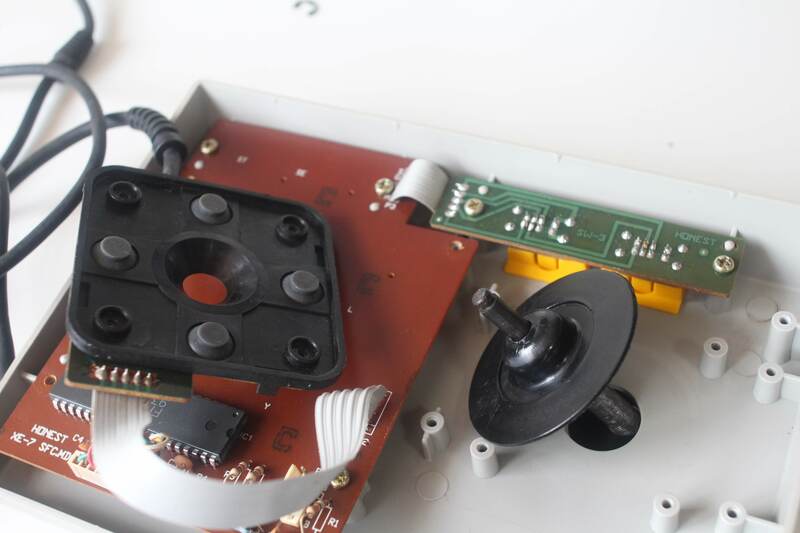 And also remove the rust from the joystick post. 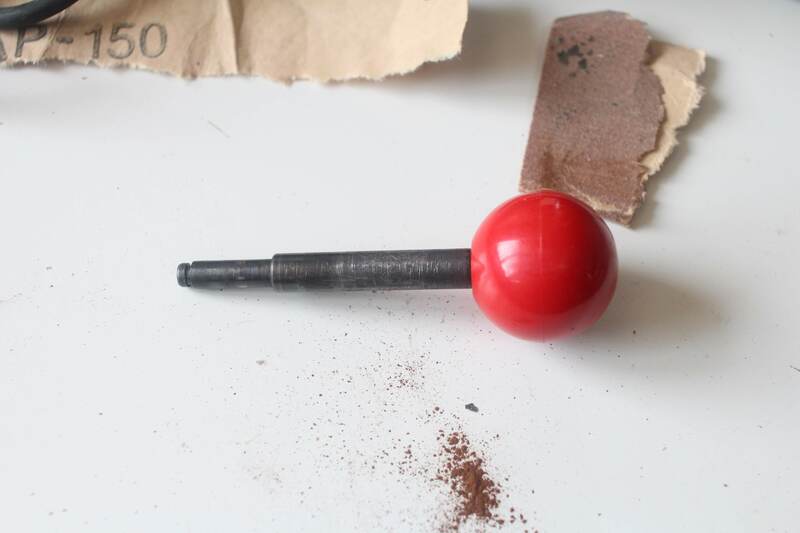 I used some sand paper and WD-40 on the rust, and then sparingly applied some grease to the parts of the joystick that slide over each during use. While inside the case I also took the opportunity to clean the pads for the other buttons. 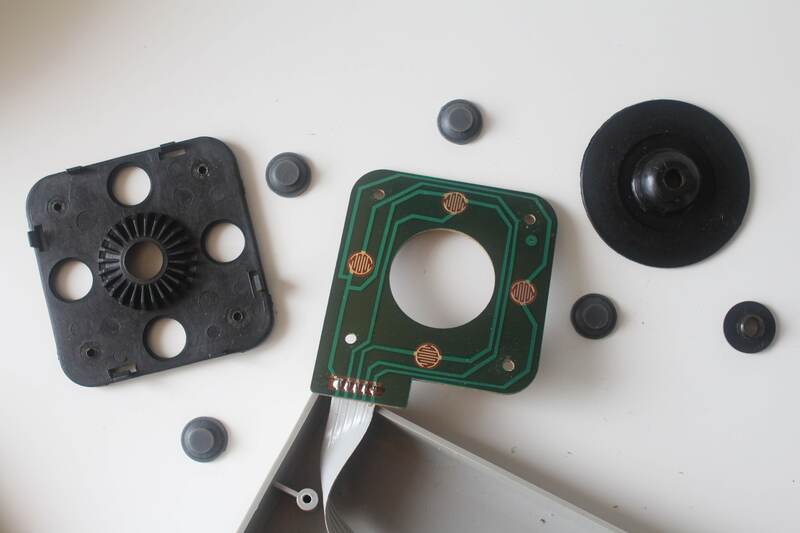 The conductive pads for the action buttons simply rest on the buttons – There aren’t any retaining posts, even though the pads have holes on the corners. These pads were probably used in many models of joystick. After a good clean the joystick and buttons felt great. 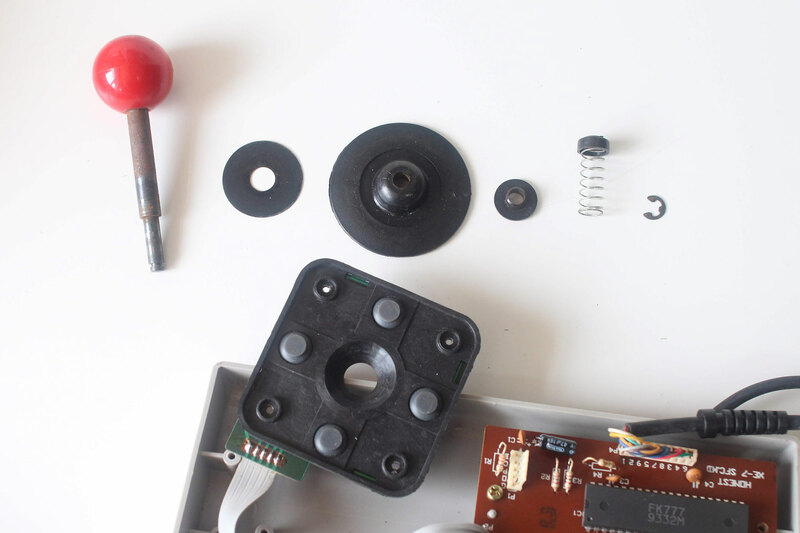 It’s not a pro-arcade joystick or anything, but it’s a well-built and a convenient option. The ability to connect to both SFC and MD really sold me on it. I can have it connected to both consoles and play Axelay or Truxton without having to find another joystick. Plus I really like Honest’s stuff, they seem to be one of the better Taiwanese accessory manufacturers. Some more photos of the Honest XE-7 SFC.MD.